The DIR-822 AC1200 Wi-Fi Router is a powerful wireless networking solution designed for Small Office/Home Office (SOHO) environments. By combining high-speed 802.11ac Wi-Fi specification with dual-band technology and Fast Ethernet ports, the DIR-822 provides a seamless networking experience with a high degree of convenience and flexibility for SOHOs. The DIR-822 AC1200 Wi-Fi Router upgrades your network to the latest high-speed wireless technology to bring you lightning-fast Wi-Fi speeds of up to 1200 Mbps1 so you can meet the ever-greater demand for multimedia applications. - Enjoy streaming media, Internet phone calls, online gaming, and content-rich web surfing throughout your home or office. - In addition, 10/100 Fast Ethernet ports give you solid, dependable wired performance for devices such as NAS, media centers and gaming consoles. 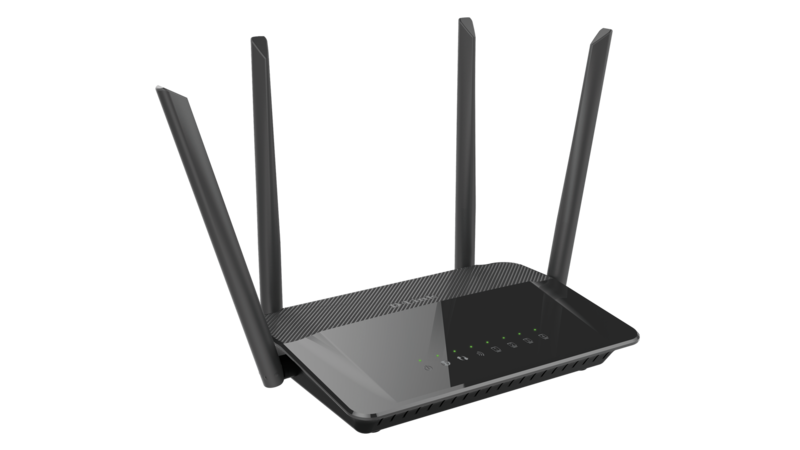 The DIR-822 AC1200 Wi-Fi Router features dual-band wireless, allowing you to operate two concurrent, high-speed Wi-Fi bands for ultimate wireless performance. - Surf the web or make important Internet phone calls on the 2.4 GHz band, while simultaneously streaming digital media on the 5 GHz band. - What's more, each band can operate as a separate Wi-Fi network, giving you the ability to customize your network according to your connectivity needs. You can even configure a guest zone to give visitors Internet access without compromising the safety of your SOHO network. -Sharing your Internet connection doesn't have to be a complicated process - just open a web browser to access the setup wizard and follow the easy stepby- step instructions to get started. - Implement WPA/WPA2 wireless security in minutes with the wireless network setup wizard, or use Wi-Fi Protected Setup (WPS), which establishes a secure connection to new devices without the need to enter settings or create passwords. - In addition, the built-in firewall protects against malicious attacks from the Internet, and access control features allow you to restrict access to your network giving you greater control over network users.